A brief post tonight. Here is an image very likely-- and likely to be believed-- as Edgar Allan. This portrait was pained by a John McDougall, about 1846 in New York City. This likeness is one of only a select handful of images believed to be authentically Poe. 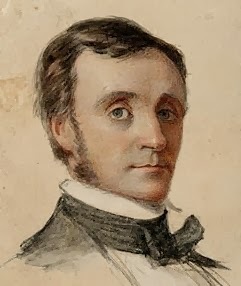 Unlike the more commonly thought image of Poe moustached and with deep, sullen and sunken eyes, this picture would likely be more close to how Edgar would have looked during the composition of some of his earllier works. Courtesy of the "Poe Boston" Facebook page.